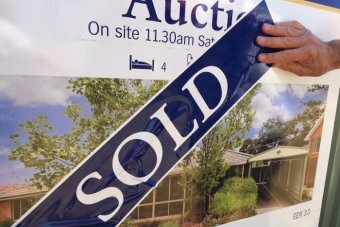 Surging house prices in Sydney and Melbourne have helped keep Australia near the top of an annual list of the world’s least affordable countries. Australia is second only to Hong Kong for housing costs, with the Asian banking hub occupying a unique position given its high-income elite, miniscule size and proximity to mainland China. Demographia’s annual survey of property markets in eight countries (and one “special administrative region” within China – Hong Kong) shows the typical Australian house costs 5.6 times the median household income. That figure masks stark differences across the country, with Sydney’s recent double-digit annual property price growth sending it into a league of costliness previously not seen outside Hong Kong. Demographia’s report shows Sydney’s house price-to-income ratio had the biggest annual increase in the 12-year history of the survey. The typical Sydney house cost more than $1 million, a whopping 12.2 times what the middle-income household in the city earns in a year. That figure, from third-quarter 2015 data, is 2.4 points worse than Sydney’s already extremely unaffordable reading of 9.8 in 2014. It also means that Sydney has leap-frogged Vancouver as the least affordable housing market after Hong Kong, with the Canadian city pushed to third at a price-to-income ratio of 10.8. For those on middle and low incomes the prospect of ever becoming homeowners has now all but vanished. Melbourne came in equal fourth, with Auckland and San Jose, at 9.7, leading San Francisco (9.4) and London (8.5). It is important to note that Demographia looks at house prices rather than units, and that the study does not take into account the very different lot sizes across different cities (with Australian houses generally much bigger than their UK counterparts). Demographia considers that a house price-to-household income ratio of 5.1 or more is “severely unaffordable”, with 4.1 to 5 “seriously unaffordable”. A ratio of 3 or less is considered “affordable”, with Demographia arguing that most cities were at those levels prior to a global property boom starting in the 1980s and ’90s. 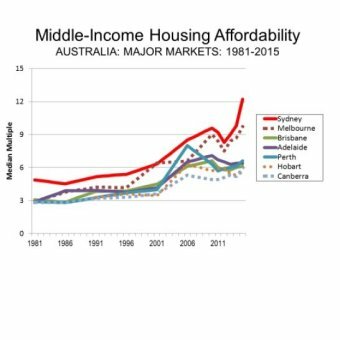 All five of Australia’s major metropolitan areas (those with a population over 1 million) were “severely unaffordable” for the 12th year in a row — that is, every year the study has been conducted. Perth had a price-to-income ratio of 6.6, although this is likely to fall as property prices keep sliding in that city, while Adelaide’s ratio was 6.4 and Brisbane’s 6.1. Outside the big cities, Tweed Heads was the most costly place to live with a ratio of 9.3, while Bowral-Mittagong, the Sunshine Coast, Port Macquarie, the Gold Coast and Wollongong also had price-to-income ratios of 8 or more. However, the figures in markets with a high proportion of retirees may be skewed by high-wealth, low-income older households. The two most affordable towns in Australia were both Western Australian mining centres, where those who still have employment earn high wages, but house prices have slumped on the mining bust. Karratha in north-west WA had a ratio of 2.5 and is thus considered “affordable”, as is Kalgoorlie at 2.9. Senator Bob Day, a South Australian representative from the Family First Party and former president of the Housing Industry Association, wrote the introduction to this year’s report. He said that for more than 100 years the average Australian family had been able to buy a home on one wage but this is no longer possible, with a similar situation in many other Western nations. “The economic consequences of this change have been devastating,” he argued. Senator Day, and the Demographia report authors, have blamed zoning restrictions and other building regulations for pushing prices higher. “It is important to remember that the ‘scarcity’ that drove up land prices is wholly contrived – it is a matter of political choice, not geographic reality,” he wrote.